Remember that crazy Pantech Vega LTE phone which sports 800x1280 pixels on a 4.5" LCD display, that rings in 335ppi - the highest pixel density out there? 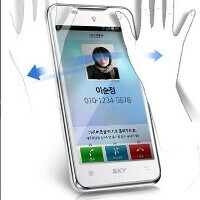 Sadly, it is only sold in Korea for now, but it looks like the folks from Pantech embedded one more "i'm first" feature in the handset - gesture recognition. They use the front-facing camera to read your hand movements, and the phone reacts accordingly. For now it supports the most common situations, like waving to answer a call, flip an e-book page, browse pictures in the Gallery, or change a song, after your hands have been buried deep in the KFC bucket (or while making dough, as in the promo video below). The Pantech Vega LTE is powered by a dual-core 1.5GHz Snapdragon S3 processor, and we know Qualcomm has been experimenting with gesture recognition after acquiring GestureTek. So has Texas Instruments, which is powering the new Samsung Galaxy Nexus and Droid RAZR, so hopefully we will see similar tech in other Android handsets soon. Its nice on a way going to look ke im doing witch craft with my phone cool tho.. Sorry to burst your bubble but not only wurope gets amazing phones so does canada and mexico. Only the US is screwed. But I don't know if you noticed u probably haven't but EVERYTIME a new phone comes out in europe it always comes out a few weeks later in mexico then in canada. But yea mexico and canada have every phone europe gets they have better phones than US carriers I never really understood why?. Look up vodafone uk or t-mobile uk and look up telcel mexico and rogers canada they all have the same phones. Now look up verizon wireless or at&t wireless they have good phones but not as cool as the european and mexican and canadian carriers. . Lile for example canada and mexico got the nokia n8 a few weeks after it was announced in europe that phone with an awesome camera never made it to the states..
Why cant pantech make decent high-end phones in america? My thoughts exactly. I was less than excited to see it was Pantech manufacturing this.